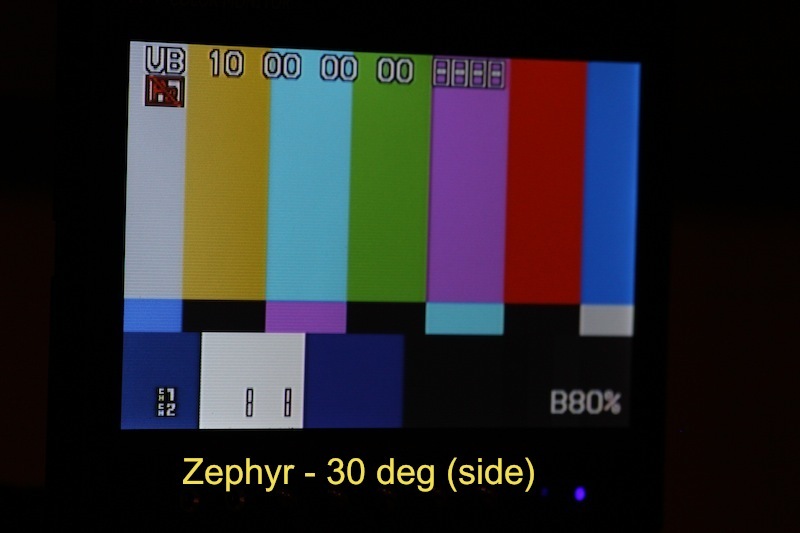 There's also viewing angle comparisons--both left to right and up and down. Mark, not suggesting this responsibility lies on your head but I do want to point this out for those reading who may be taking everything as gospel. 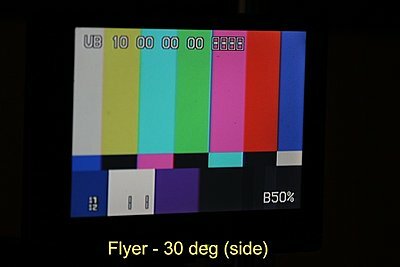 The demands of a Steadicam monitor are VERY different than other applications, in that your viewing orientation to the monitor is constantly changing which is a big challenge for LCD's. Just booming all the way up and down with some monitors causes the image to reverse out. Jibs are similar in this regard but you have more possibilities of coming to a stop and adjusting the tilt on the monitor in that instance, whereas with Steadicam, you can't do that during a shot. Exteriors are the biggest pickles. The best you can hope for in a shade is one that has top and side flaps, but even that will be too restrictive for many moves. The popular wraparound shade is all but useless unless you are doing a shot that requires virtually no panning or booming. 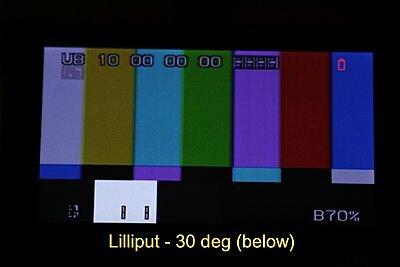 This is why daylight performance is so critical in a Steadicam monitor. Understood and agreed on all counts. Note that the Flyer is pretty good off-axis in all directions. 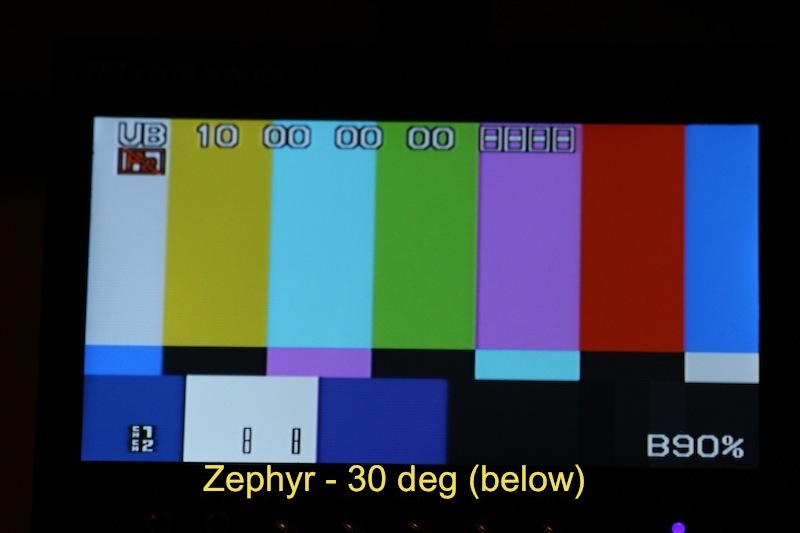 The Zephyr is relatively good from "below", as in when you are boomed up and tilted down. 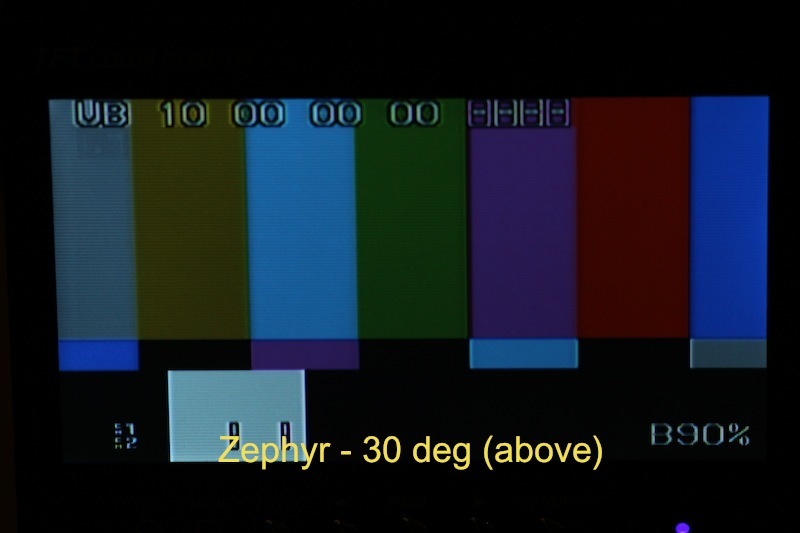 The Zephyr is not nearly as good from "above", but in fairness I wager that's a less common Steadicam scenario. The Flyer monitor had plenty of "above" brightness as you can see. In fact, if I'd known that earlier I might have flipped my Flyer monitor to make use of that. 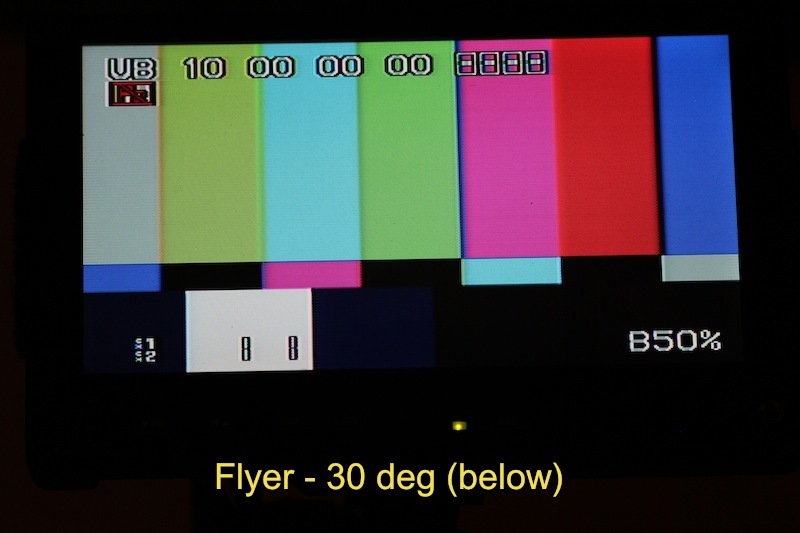 Though I don't have pics, the Flyer monitor was generally very viewable at very oblique angles in any direction. Good straight on, mediocre side, plenty of "above" brightness and relatively poor "below" brightness. A definite candidate for mounting upside down...but that creates a complication for the needed rigid, stable mount, since the Lilliput doesn't have a 1/4-20 screw hole on the top. I need to point out that the 30 degrees off-axis is approximate, I didn't have the time or inclination to make it a fully scientific test, just a quick test to get a handle on the issues. 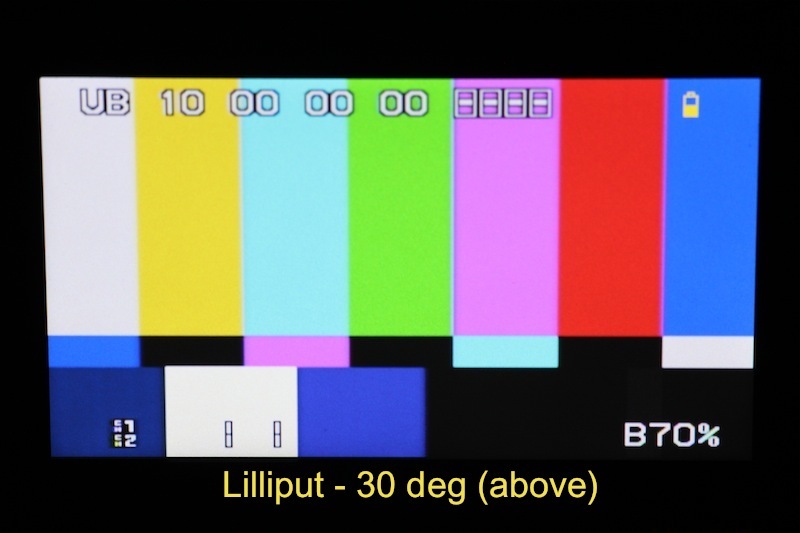 Any of you real geeks out there care to put these images in FCP's scopes or Photoshop's histogram? Here's the latest situation with my zephyr "monitor". Before I take it any further I thought I'd better check with you guys as to whether I might be making some stupid mistake myself. I have tried to attach images of the issue but it's not working on either firefox or opera, so maybe there's some site problem at the moment. I'm not a real wiz on how LCD monitors work but in CRT terms I would say suddenly my monitor color guns have gone out of alignment. There are 3 very separated images as I pan from left to right. Red, green and presumably, but not obviously, blue. 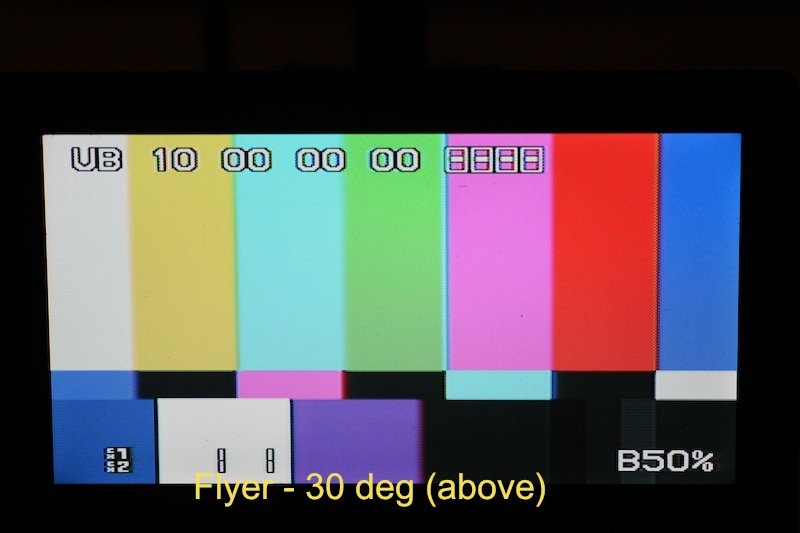 The camera signal is via BNC video out into the top stage video in. I really can't see how I could have it wrong but am open to suggestions! Hmmm. My quick guess is that you have a bad cable or connector somewhere. Doesn't sound like the monitor. 1. Bypass the sled video, run composite directly from camera into the monitor via a cable and (if necessary) a bnc to rca adapter. 2. If still a problem, then try a different video source, different cables, different adapters. 3. 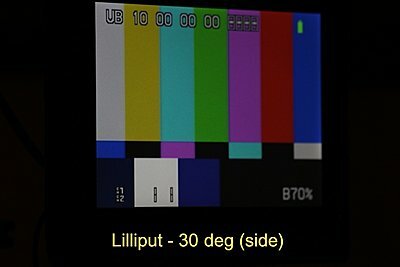 Run video through the sled, but disconnect the monitor and connect it to a separate external monitor. These tests should help you isolate pretty quickly. I'm not saying it can't be the monitor, but I've had similar symptoms with bad cables or connectors. Thanks Mark, like your thinking. An update on payload tests, I did some detailed testing about the lifting capacities of my Zephyr, both minimum and maximum. I found the minimum camera weight to be about 9 pounds and maximum to be 23-24 lbs. The originally-published specs were 5-24lbs. I shared my results with Tiffen, wondering if my arm was somehow out of spec. They confirmed that my arm is working correctly. They have now revised their website to reflect a 9-23 lb "net camera capacity", which happens to be consistent with my results. 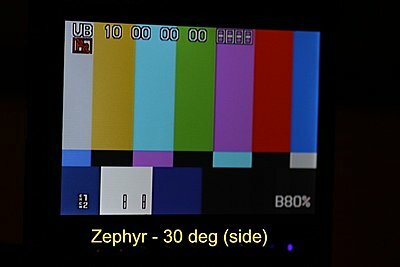 So, if you are looking to fly a DSLR with a Zephyr, you will have to add weight (accessories or a weight plate) to the top stage to increase the weight. The top end of the range will allow you to fly nearly any broadcast camera and many RED configurations, a breakthrough for a genuine Steadicam under $10k. If you anticipate long stretches in the rig with a DSLR or lighter video camera (doc or live music or event shooting) then the new Scout's payload range (assuming it is accurately-stated) or the Pilot may be a better fit for your needs, allowing you to fly the lightest possible configurations.